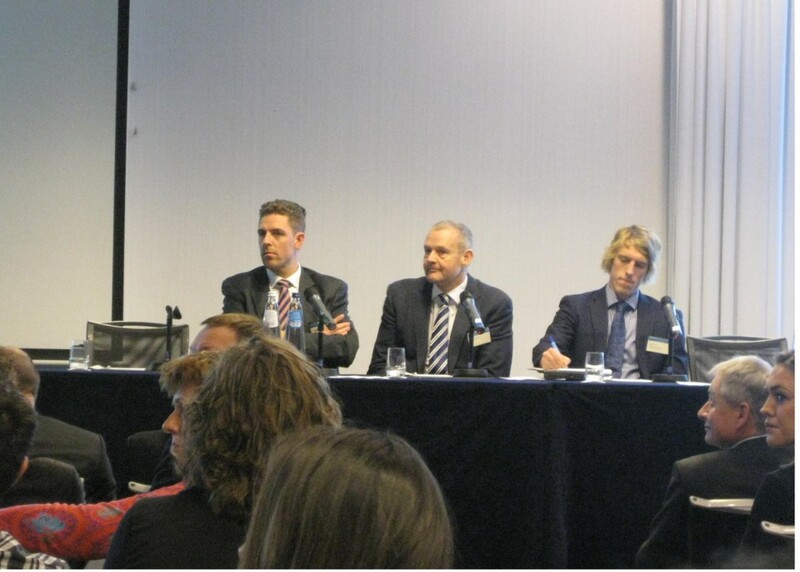 On 11 December 2014, True Price had the pleasure to organize the annual True Price Conference and Green Deal Event on Natural and Social Capital, an event in collaboration with MVO Nederland, IUCN NL and the Ministry of Economic Affairs. After a short introduction about the Green Deal on Transparency for Natural and Social Capital by Herman Mulder (Chairman True Price), Adrian de Groot Ruiz (Executive Director True Price) gave a keynote on how True Price works on integrating different dimensions of value. This was followed by a keynote by Rob van Brouwershaven (Dutch Ministry of Economic Affairs) on the role of the government to stimulate transparency. Mark van Oorschot (PBL), Frank Hoekemeijer (Heijmans) and Patrick van Bael (DSM), explained how they are bringing transparency on natural and social capital in practice at different levels in their organisations. After a short break, the international scene on natural capital was sketched by Geoff Richards (Defra UK), Mikkel Stenbaek Hansen (Danish EPA, Danish Ministry of Environment), Richard Spencer (ICAEW), Strahil Christov (EU Business and Biodiversity, B@B platform), Liesel van Ast (UNEPfi) and Daan Wensing (IUCN NL). They covered topics such as projects by the Dutch and UK government on biodiversity and ecosystems, how transparency can simplify the complex problem of true value and the role of finance and investment in valuing environmental and social impacts. Interesting discussions arose on the government’s role to support frontrunners, the need for harmonization of different approaches to valuation and the development of common metrics. After a vibrant networking lunch, the True Price Conference was opened by Michel Scholte (Director External Affairs True Price), who presented the True Price Platform outlook for 2015 and the second edition of the Business Case for True Pricing Report. Dave Boselie (IDH), Marieke Kragten (Hivos) and William van Niekerk (BAM) presented cases of how true pricing has been applied to some of the products relevant to their organisations (agricultural commodities, roses and asphalt). This led to an interesting discussion on the opportunities for government and business to transform markets by seeking collaboration and stimulating sustainable businesses through e.g. procurement. Fokko Wientjes (DSM) delivered a keynote speech on harmonizing and further developing innovations on monetizing impact. The conference closed off with the launch of True Price’s publication on ‘Principles on Methods for Impact Measurement and Valuation’. The document has received a lot of attention from both public and private sector professionals, as well as prime time media coverage. Experts, and members and partners of the True Price Platform can apply for access, read more here. Adrian de Groot Ruiz held a keynote on True Value and talked about the spread of monetized impact information, the positive impact of monetized information and explained true value creation. Click here for a summary of the slides. Rob van Brouwershaven gave a presentation on the government’s role to stimulate transparency. See here why transparency is the natural way forward. Mark van Oorschot talked about the work of the Dutch government on biodiversity, national sustainability assessments, Netherlands sustainability monitor and the TEEB-NL program. You can see a selection of the slides here. Frank Hoekemeijer presented how Heijmans takes up a pioneering role in the True Price Procurement program and what the impacts, opportunities, and challenges are. Click here to find out more. Strahil Christov showed what is the EU Business and Biodiversity strategy to 2020 with specific targets, the Phase 2 of the EU B@B Platform and work stream outputs including next steps for 2015. See here in more detail. Richard Spencer presented the Natural Capital Protocol, highlighted the contents of the protocol, the timeline and ways to get involved. He also called for harmonizing and developing common metrics, and pointed to the challenge of scaling-up. Here you can access the presentation. Liesel van Ast spoke about the Natural Capital Declaration initiative, how finance and investment play a role in valuing environmental and societal impacts and how organizations can get involved. Click here to see the slides. Marieke Kragten gave a presentation about the ‘true price’ of a rose. This projects deals with social impacts such as women rights in the flower sector in Kenya. Access the presentation here. New milestone in moving towards True Price open standards! Comments Off on New milestone in moving towards True Price open standards!